The Vax Air Revolve Pet is a quirky, cool, and capable vacuum that outsmarts many competitors not only at a visual level, but on functional one too. Builder's dust. If you know it well, then you know just what it can do. And having caused our previous vacuum cleaner to meet an early grave, we needed a new and powerful lil sucker to replace it. Enter the Vax Air Revolve Pet, a bagless vacuum cleaner that, unlike upright models, is a cylinder that can roll behind you in either direction. We can see why it's called a "Pet" (on the box), given the way it trundles behind your heels, even if Vax calls it a "Cylinder" on its website instead. The Air Revolve takes up less space in the cupboard than an upright would, but isn't so small it could be considered a portable vac for the car. Has Vax struck the perfect balance of design and function? In terms of design, the Air Revolve is a really clever concept. Popped onto its side it'll happily roll forward and follow your cleaning path, but if you need to about-turn back on yourself the hose will drag up and over with the cylinder and come with you the other way - no need to lug the roller around. It's like a happy puppy following its owner. Or you may choose to sit the Air Revolve upright, where it will also happily sit stationary, all well behaved, which is useful when using it on a slanted surface, or on the stairs, and not wanting this Vax to try and run away like a squirrel-crazed dog tugging on its lead. Even the power lead, which is coiled away within the body, is easily tugged out by hand, then retrieved by pressing a button - which we've been using like a naughty kid playing with a budget tape-measure. Much better than manually winding that cable messily around in that typical upping and downing back-ache motion. A big handle makes picking up the cylindrical Vax body easy enough, and it's not too heavy. 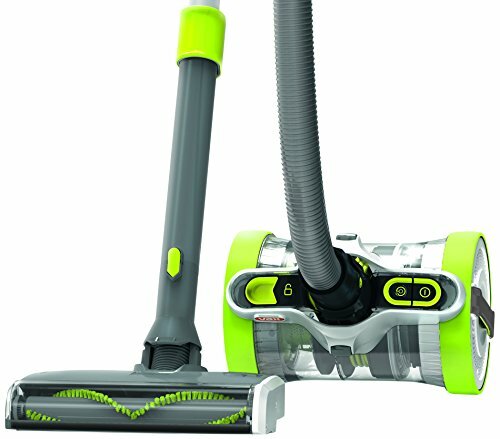 Vax says the product weighs 5.5kgs, but to our estimation around half of that weight comes from the hose, handle and powered head combination. Which is where some of the bulk lies. The head combination isn't particularly small, and while not desperately tricky to handle, it is a little heavy. So if you're expecting a portable one-handed cleaner for the car then think again - this is very much an indoor vacuum. But the size is appreciable because the head is powered, which means plenty of suction at floor level. We're particularly fond of the controls being mounted not only on the main cylindrical body, but duplicated on the handle too, making for quick on/off and brush activation control. When these mounted brushes - here the luminescent ones seen in the head - are whirring away they're really loud, but they do a darn good job of canoodling hairs, dust and grime all together. If you do have pets, though, keep them at a distance: a normal vacuum is bad enough to set them into mad mode, with these brushes whirring away they'll go next-level crazy. Following a kitchen refit we've found dust layering the whole house; the kind of dust that gets cleaned up and then magically reappears the next morning just to wind you up. That kind of dust destroyed our old two-year-old vacuum cleaner, but was no problem for the Vax Air Revolve Pet fresh out of the box. We've been using it for three weeks now and it's not once faltered, plus with a six year guarantee we don't anticipate it collapsing into a wheezing, dust-ridden heap any time soon. On wooden hard floors, seeing the visible line of clean vs dust cut through with each swipe of the Pet's powered head was a big relief. It makes light work of cleaning, without having to throw around a full upright design, which we found made it easier to see what we were doing. The large head isn't great at getting into corners or tucking into sides, though, but there are additional head options included - a dusting brush; upholstery, crevice, and hard floor tools - which perform as they should. The plastic grey finish of these extra heads isn't going to be cutting paint out of skirting boards or chipping wooden floors. However, there's nowhere to store these extras though, so they may end up vanishing into the back of a cupboard. Suction is consistently strong, but if it seems lower than expected then check the slider control on the handle, as this controls the level of airflow. It's not easily knocked out of place, but you may have left it on a middling level from previous use, for example. As for hair - and this might be where the Pet name comes from - it did a grand job of scooping up excesses strewn around the house. Although, in our case, that was just a lot of human hair; must be getting old or just moulting. Keep and eye on hair gathering between brushes, rather than all the way into the container, as this may need to be cleaned out separately to keep the suction flowing as efficiently. A standard problem with all vacuums really, but if hair knots do strike it means locating a screwdriver and taking a side panel off, which is a bit of a faff. But at least there's access. As this is a bagless cleaner, cleaning is also really easy. There's a slide switch on the body which releases the dirt container. Pop the filter away from that, tap off the excess, give it a rinse, and pour the internal gubbins straight into the bin. It's as easy as cleaning a kitchen bin (although Vax advises 24-hours drying time, which is a little impractical). Then pop it back in place and it's job done, little fuss. To look at the Vax Air Revolve Pet (or Cylinder, or whatever it wants to be called, maybe even Dave if you fancy renaming it like a pet) is the funkiest looking vacuum we've seen in a long time. But it's not just about looks; the design is well thought out too, from the on-handle controls, to small things like the button-press power lead recoil. Yes Dyson and others make some ultra-cool kit too, but for that you'll need to pay a pretty penny. At £300 this Vax isn't budget, but in our weeks using the machine at home we think it's worth every penny. The Air Revolve offers serious suction that'll whizz through dust and hair on hard floors and carpet no problems. It's smaller than an upright vacuum, we prefer its fun design and the way it'll tail behind you like a little pet all in its own right. The only potential downside we've found is the weight of the main powered head and handle combination, which amounts to about half of the whole product. But if you can chuck about a normal vacuum then this'll be of no odds to you. In short we think the Air Revolve Pet is a quirky, cool, and capable vacuum that outsmarts many competitors not only on a visual level, but on functional one too.